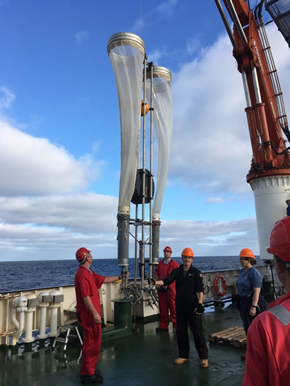 We were deploying the Bongo net – named such because of its resemblance to the musical instrument – which is a vertically-towed net for catching plankton. It had, so far, worked without incident and deployments were straight forward; simply drop the net vertically down to the desired depth, wait a couple of minutes, then haul it slowly straight back up. Repeat as necessary. Its simplicity is the secret to its robustness. There aren’t that many parts to go wrong. But if it can go wrong, it will. Losing your first net over the side, you go through the same seven stages of loss that psychologists have discussed for years. First comes denial. We knew something wasn’t quite right before we even saw the snapped wire. There was too much slack in the line. However, when the break made it to the surface, there was thirty seconds of everyone on deck not really believing what was in front of them. Didn’t there used to be a net at the end of that wire? Is it still just beneath the surface of the water? Is that broken, frayed steel wire just, in fact, a trick of the light? I’m sure it’s not as bad as it looks. Next comes guilt. What did I do wrong? Did I make sure nothing was tangled? Did I do up that shackle properly? Did I drive the winch too hard, putting too much tension on the cable? That was £20k’s worth of net that was my responsibility and now it’s gone. These are the thoughts that go through your mind immediately after. It’s your fault. You screwed up. Anger follows as you realise that you didn’t do anything wrong. Cables were load tested. Standard operating procedures were followed. No avoidable mistakes happened. Yet it’s still gone. Well that’s not fair! How can I have done everything right and still fail?! You swear a lot, mutter something about how this is just ridiculous, and then storm off to endure a cup of tea in silent rage. The next stage is depression. Or in this case, frustration. It is just a net after all. Luckily this passed quickly, as I was finishing off my rage tea. Having a group of people around me with unwavering positivity meant that most negative feelings were washed away quickly. This then led to the upward turn. It’s not the end of the world. There’s nothing else you could have done. At least no one was hurt. It’s just a net. These comments, along with plenty of jokes about it, propel you on to stage six: Reconstruction. Traditionally I imagine this is meant as more of a metaphor. Not here. Science never sleeps and we have plankton to catch. Time to have a rummage around for any spares that can be cobbled together. Spare nets? Check. A suitable frame? This will work. How’s it held together? Plenty of rope. Of course it is not as sophisticated as the original – there is no motion compensation system, so the samples won’t be as well preserved. And there is no pressure-activated valve system to allow sampling from specific depths. But it’s more than what we had earlier today. Finally comes acceptance. There’s a saying aboard the ship – anything you put over the side, be prepared to never get back. It’s just the nature of the job that things will go wrong and equipment will be lost. But with the right preparations and a positive and hard-working team around you, it won’t feel like the end of the world. After all, it’s just a net. Dan deploying the new nets he constructed from spare parts!